For a relationship that is full of tumult, turbulence and twists, the setting for the latest summit between Prime Minister Manmohan Singh and his Pakistani counterpart Yousuf Raza Gilani stood out for its placidity. After his tough talk with the Army for withdrawing the Armed Forces Special Powers Act (AFSPA) from parts of Jammu and Kashmir, Chief Minister Omar Abdullah today said his government had the authority to revoke the controversial law and sought a 'workable' solution from the Army. Sacked Rajasthan minister Mahipal Maderna was today quizzed by the CBI over his alleged links with missing nurse Bhanwari Devi. He is understood to have admitted that he knew her. Expanding its probe, the CBI is focusing on the alleged role of another senior Commonwealth Games Organising Committee (OC) official, also an aide of Suresh Kalmadi, in various irregularities in projects related to conduct of the mega sporting event. 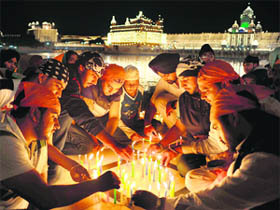 Asserting that the government and scientific fraternity were comfortable with the safety levels at Indian nuclear power generation plants after a complete technical audit and stress test were carried out at all reactors recently, Chairman of the Atomic Energy Commission, Dr Sreekumar Banerjee, said that the need of the hour was to generate greater awareness among local residents that such plants do not have adverse health effects. Former commandos of the British Army are reputed to be a tough breed. So, when they come looking for inspiration from an Indian martial arts instructor, they are looking for something very special, if not unique. 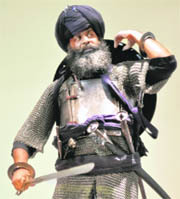 Nidar Singh Nihang in traditional armour.